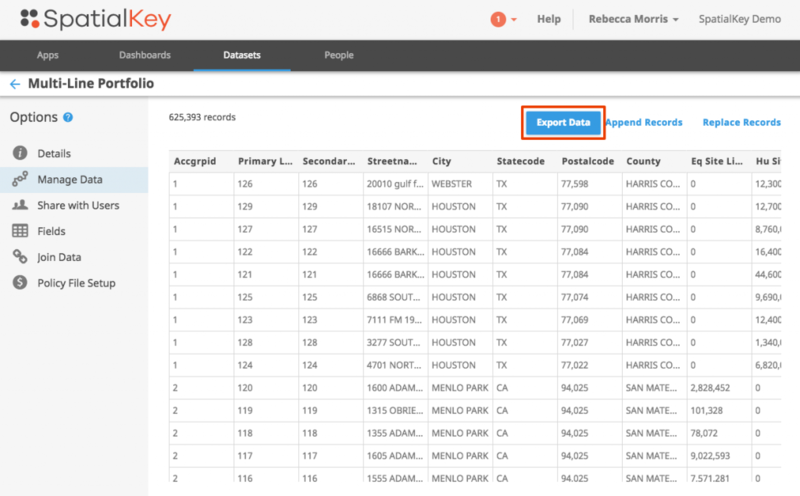 As easy as it is to import data into SpatialKey, exporting data is even easier! SpatialKey allows filtering and exporting data in multiple ways. You can export records from your dataset or export aggregated data from the visualization pods. There are a couple places where you can export records from a dataset. Records from datasets can be exported from the Datasets tab. First, select the Datasets tab and find your dataset. Click on the gear icon to view data settings and select the “Manage Data” option on the left side of the screen. Before preparing and downloading your file, you can select which columns you want to include in the export. Records from datasets can be exported from the dataset configuration panel within a dashboard. Before preparing and downloading your file, you can select which columns you want to include in the export. Records can be exported from the record list pod in a dashboard. The difference between what is exported here vs. in the other methods described above is that the records exported from this pod could be a filtered list. When working in a dashboard in SpatialKey, you have many opportunities to filter that data you are viewing. This record list pod will contain a list of all records subject to the filters applied in the dashboard. Also, you don’t have the option to select which columns to include in the export when exporting from this pod, all columns will be included. When data is exported from visualization pods, aggregated data, subject to any applied filters is included in the export. Aggregate data can be exported from the histogram pod, timeline pod, and any categorical pod. Here are a couple of examples of pods and the export results. Example 1: Export from unique value list pod. Filters have been applied in the dashboard so only these 6 records remain in the unique value list pod. Here are the results from the export. Notice how all information needed to recreate the pod is included, but nothing more. Example 2: Export from histogram pod. Filters have been applied in the dashboard so only these records remain in the unique value list pod.